This one is a mash-up. 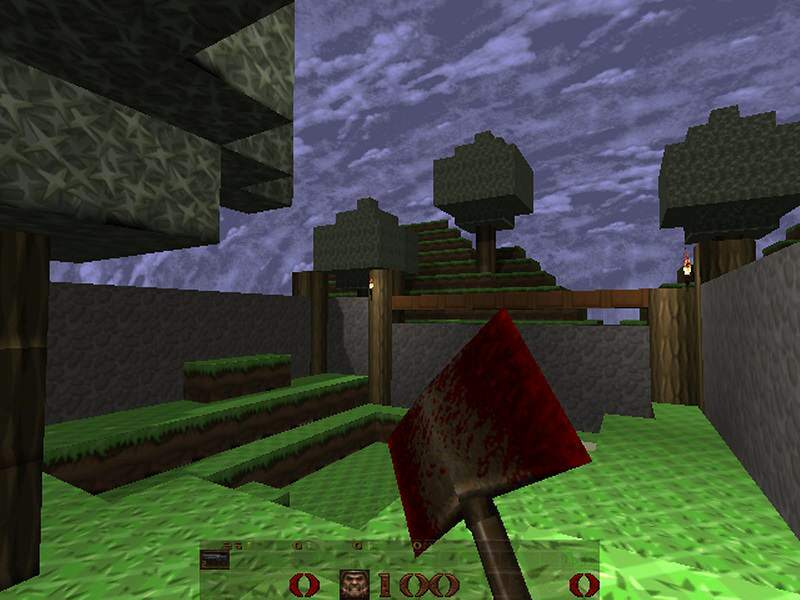 Tom Mustaine wanted to see if Minecraft-like gameplay could have been prototyped back in the 1996 era Quake tech. His answer was positive! “Starting with vanilla Quake1 and QuakeC I was able to create a new entity called func_minecraft_block that behaves like Minecraft’s blocks in that they take damage, provide feedback when hit (colored particles in Quake1 vs texture damage in MC), and when “killed” drop themselves for pickup into the player inventory. While this worked beautifully, a limitation arose pretty quickly with the vanilla Quake1 entity limit. I could only place a very small number of blocks before running out entities. To get over this hump, I picked the Darkplaces Quake1 sourceport since they had changelogs relating to cranking up the number of edicts/ents. Did you here there is another thing called quake craft, its a minecraft server that tries to remake quake in minecraft (Q3 i think), this is awesome! Hey @Dom, do you have a link for this?